The SF & W got hit hard by winter this year, starting in November.The snow was 24 scale feet deep by the end of January. 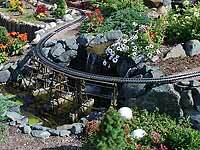 Once the snow cleared, and the garden dried up, we were able to start work on and complete the upper track. This was installed along with 2 wooden trestles that I built and was operational in August. We once again had an open house that attracted approx. 150 people to see the garden. Everything ran very smoothly except when one child (parent will remain nameless) decided he wanted to touch one of the trains while it was going by and knocked several cars off in the tunnel. The next train through found those cars and pushed them out! Not exactly the way I would have wanted to clear the tunnel, but it was effective! This is a You Tube video of our garden that I shot this year. Click on each thumbnail image below to see an larger image. 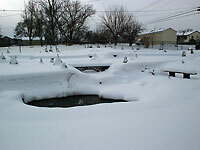 Here is our garden in mid winter. 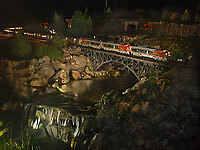 A passenger train is seen here passing over the Canyon Diablo Bridge. 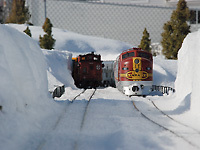 Shot from track level, Train #17 is passing through the cut made by the rotary snow plow. This is one of the two trestles added in 2009. 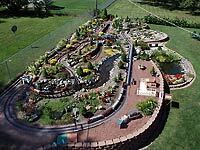 Construction of the upper track began early in the year, just after we had planted our annuals. We finished the track in August, and ran our first train on August 5th. 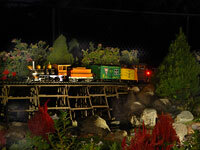 Our little freight steamer is seen here coming off one of the trestles. 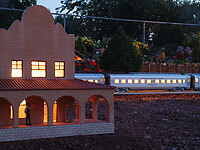 Among other "on-going" projects, we are constructing a model of a Fred Harvey hotel for the garden. 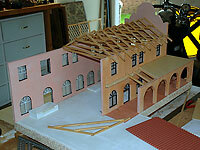 The building we chose is the Castaneda Hotel in Las Vegas, New Mexico. Here is a shot of the track side of building that I shot in May of this year. Our version of the hotel will be smaller than the actual. I spent approx. 5 hours measuring the building back in 2008, then drew up everything in CAD. 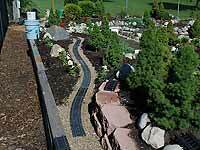 We have eliminated several feet in each direction, to make the scaled version not too large. 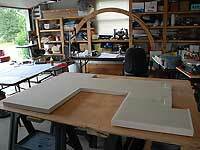 Precison board is being used the for the base and wall construction. Here, we have the base and limestone foundation walls attached. After the walls were painted and grouted, and the roof trusses built, we were able to start assembly of the north wing of the building. 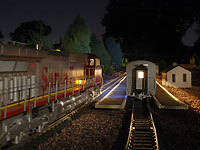 Prior to our annual open house for the garden railroad on September 13th, we had everything set up the day before and did some night photography. The following images are from that evening. 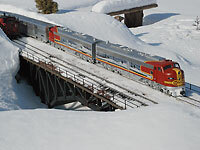 In this first image, the Super Chief snakes by the catus, crossing a new steel bridge, built by Dan McNelly. Lorrie's new farm can be seen in the background. 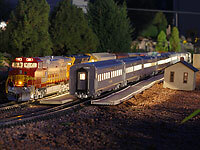 Just behind our newly added Fred Harvey hotel, the Super Chief pulls into Las Vegas, New Mexico at sunset. Here we see passengers steping off the train onto our new paver brick platforms. 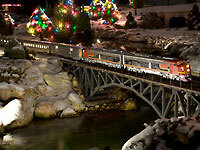 A freight has pulled in along side the passenger train. Another freight pulls into the station. Our narrow guage steam train rounds the wooden trestle. 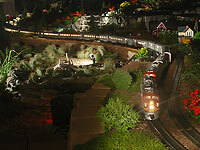 Our last shot of the evening, we caught 3 E units crossing the Canyon Diablo Bridge. This is my annual shot from the house roof to document how much we got done in 2009. I shot this on the morning of our open house, Sept. 13, 2009. 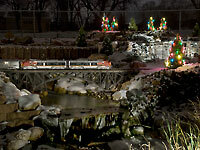 These next 3 images were shot on the evening of December 7, 2009. We had received just enough snow to provide a nice covering, but not too much to cover everything. I turned on the pumps in order to have some water spilling over the falls. 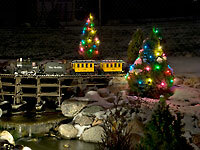 I decorated 16 trees in the garden, to make it look festive. 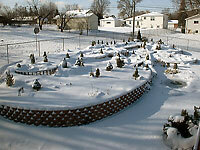 After 8" of snow, here is the garden on December 10th. The railroad is shut down. Not even passenger trains are getting through. The local makes it out onto the mainline, after 3 days of snow. This was shot on 12-29-09.